Note: This week’s guest post is written by Liz Chuah and also appears on her personal blog. Liz is a graduate student at the University of Michigan School of Information specializing in Human-Computer Interaction. To make or not to make…? That is not the question. The more suitable question is: Is baking a kind of making? Last Saturday, I took a Bake with Zing class with my housemate at Zingerman’s Bake House. 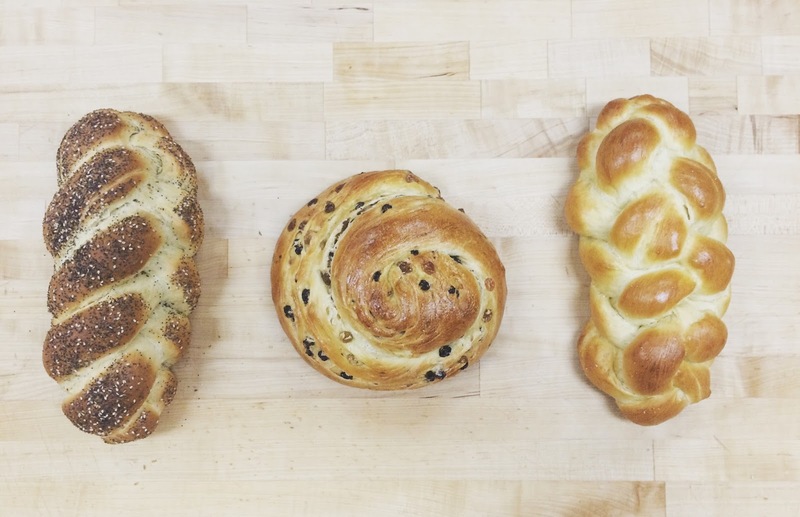 It was a class that taught how to make Zingerman’s soft and rich challah bread (pronounced “ha-lah” not “cha-lah”). The day before this class, I thought, hey, I’m learning something new, right? I’ve never made bread before and I don’t really know how to. And here I am, finding ways to learn how to make a particular kind of bread (albeit, a slightly expensive way $100!, but still). So isn’t this a “maker” activity for me? Well, we’ll find out by the end of this blog. But first, I would like to go through what actually happened in the class. When we arrived in the classroom at Zingerman’s, there were ingredients such as the flour, yeast, eggs, oil, water, honey, and salt already measured and laid out for us at each of our assigned seats. After Dan, the teacher, finished explaining some of the facts of protein and a round of introduction, he began to demonstrate how to make the challah bread, pouring in the ingredients as he explained. While he was doing this, I thought, hmm…. It would have been nice if I could’ve started the entire process from scratch. Of course, it would have been complicated and more time-consuming to have each person crack their own eggs and measure their own water but at the same time, I felt a slight lack in my learning for not being able to do that myself. In any case, we began by pouring in the prepared ingredients as instructed. And then came the part where I felt like I learned the most. We had to form the mixture into a dough by kneading the sticky pile for about 5 minutes. At first, it was difficult because the dough was just sticking all over my hands and fingers and scraping it off was not only difficult but also seemed kind of gross. But as the instructor and his assistant made their rounds, they would give us tips about technique and a small demonstration with our dough. They encouraged using the palm of the hand, not the fingers, pushing the dough closely parallel to the kneading surface with quick motions. Totally NOT what I was doing. When I got the hang of it, the dough shaped up pretty nicely and it was very gratifying to see the result of what I did. While the bread was left to rise, the next step was to learn how to braid (for the 5- and 6-braided challah). We were first taught with rope (alongside our formula sheets) to learn the technique and then eventually applied the learned technique to our actual dough. This was interesting. The rope obviously did not have the same stretchy texture as the dough, so we had to tug on the rope much harder to tighten the braid compared to when we were working with the dough. The braid was confusing because each strand was replacing the strand it crossed over. But again, once we got the hang of it, it was also gratifying to see a beautifully patterned braid. I also felt extra proud when the instructor took my braids and said, “Wow, you did this one really good,” as he unknotted it for the next person to try. After we completed rope practice, our dough had risen enough. There was a quick demonstration again and we were then tasked with making a turban and slicing the other two loaves into 5 and 6 pieces (depending on which braid we were working on) and rolling them into these fat long strands with very thin ends. These strands were then grouped together at the ends and we were ready to start braiding. The dough was in some ways easier and in some ways harder to work with compared to the rope. The dough gave in to our manipulation way easier than the rope but it was also slightly harder to control. I had to make sure I wasn’t pulling too hard or too little because if I pulled too hard, the strands would become really thin but if I pulled too lightly, the dough would just spring back into its original place (because of the gluten). After a few rounds of the braiding formula, my braid was egg washed and ready. It looked so neat and pretty! Neat things make me feel so happy and accomplished. Finally, the last step was to let it proof, egg wash a second time, and into the oven it goes! This part of my learning process was also slightly disappointing as the assistant did every thing for us. We were told how to tell when the dough was under-proofed, over-proofed, or proofed enough but we were not given the opportunity to test our own dough. The assistant also egg washed them the second time for us, put it in the oven, and even watched it all on our behalf to see when it was ready to come out. Not really what I was hoping for. In the end, we got our breads. I still feel really proud of myself. And I asked myself again: is baking a making? My answer is yes and no. If I were to learn to make this on my own at home, baking is definitely a type of making because there would have been way more failures and mistakes to learn from compared to being in the class. However, in the context of my experience described, I would say, the class overall was not really a making experience since many things were prepared and done for us and I can’t entirely say that I made it all by myself. The class was built to be a success (otherwise, no one would want to take it). If I were to compare this in-class experience with the maker identifications in AnnMarie Thomas’ book Making Makers: Kids, Tools, and Innovation, there was very little room for experimenting (although that does not stifle curiosity, but it also does not satisfy it) and little room for risk. However, specifically related to learning technique, I would say, it definitely was a making experience. I did learn to knead dough. I did learn to braid challah bread. I was responsible for my own dough and had to make a decision whether to use that one strand that fell to the floor while I was rolling it (5 second rule, I promise!). Much knowledge was not only shared by the instructors but even contributed by fellow students with more experience while questions were supplied by less-experienced students. Sure, this may not have been the cheapest way to learn how to make bread but I would not say it was not resourceful. Just as online instructions are a resource, in-person classes are also a resource. Lastly, I believe touch, texture, and reiteration are all essential in the learning process. Actually being able to feel the sticky dough as we were kneading it, correcting our hand technique after receiving instruction from the assistant and then repeating the process with this new technique taught me how to tell when the dough was ready and when the dough needed more kneading. I did receive a lot more help than if I were to try making this on my own at home but I did make it and I did learn from making it. If anything, this class sped up my learning process and equipped me with the basic skills to advance my future maker activities in baking. Do you agree that baking is making? When does something become too structured to be considered making? Share your thoughts in the comments below or with us on Twitter!